The MAPK/ERK pathway is a chain of proteins in the cell that communicates a signal from a receptor on the surface of the cell to the DNA in the nucleus of the cell. The signal starts when a signaling molecule binds to the receptor on the cell surface and ends when the DNA in the nucleus expresses a protein and produces some change in the cell, such as cell division. The pathway includes many proteins, including MAPK (Mitogen-activated protein kinases, originally called ERK, Extracellular signal-regulated kinases), which communicate by adding phosphate groups to a neighboring protein, which acts as an "on" or "off" switch. Also known as the Ras-Raf-MEK-ERK pathway. When one of the proteins in the pathway is mutated, it can be stuck in the "on" or "off" position, which is a necessary step in the development of many cancers. 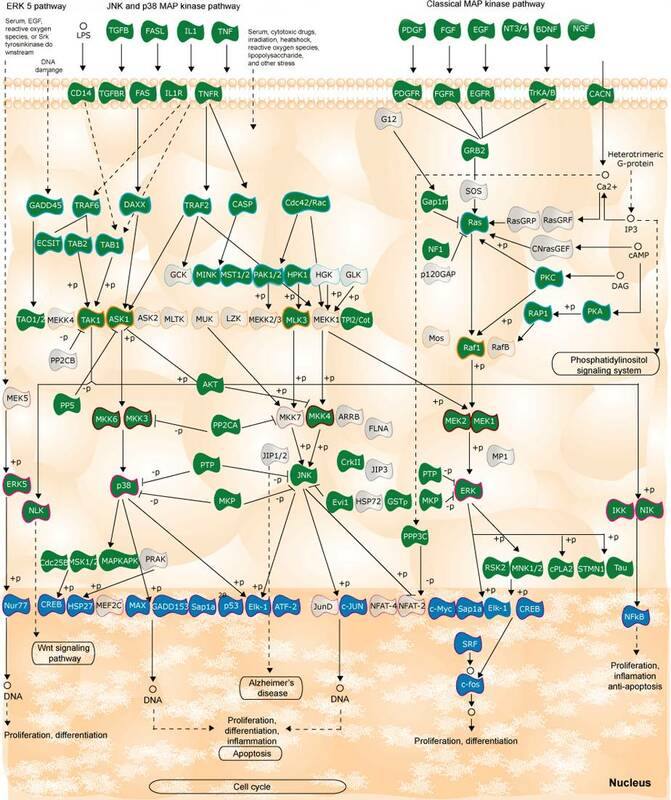 Components of the MAPK/ERK pathway were discovered when they were found in cancer cells. Drugs that reverse the "on" or "off" switch are being investigated as cancer treatments.